I don’t know about you, but when the days get longer, I can’t help but enjoy what it means for the children. It’s a time to hang out and just have fun in the sun after the confines of our cold, rainy or snowy winter, depending of course on where you live. As we start to move toward summer though, it strikes me that so many parents spend the summer holidays desperately trying to keep their wee ones entertained. Often I’ll suggest the reason why kids need downtime and find parents argue that if their kids aren’t kept busy in structured activities, or they aren’t entertaining them in some way, shape or form, then they’ll get in to stuff. The urge for parents to keep their kids busy is ever present, as though it’s an antidote to the terrible alternative of having nothing particularly constructive to do. Think about the word ‘constructive’ for a moment. It actually means ‘improving yourself’ or constructing one skill on top of another and for many parents, that’s part of the allure of structured activity. Kids can learn something defined, like how to dance or play and instrument or soccer. But it’s important to remember that children learn most by playing and playing doesn’t come with an end goal in sight, that’s why it’s playing. That’s why kids need downtime. They are learning but they are doing it on their own, free wheeling and hanging out. You may be with them physically, or you might not. If you are, perhaps you’re firmly seated in a nice deck chair with a book in your hand and your feet in the sand box, allowing your legs to be used as a nice bridge for the kids to run their dump trucks under. The question about what play really is, makes me think back to the first day of my training in the UK. It was probably the strangest class I’ve ever taken. When I entered the room, it looked like I’d entered a play school. There was a painting corner with paints, a water and sand table, everything you’d see in your average preschool. To be honest, we felt a bit silly. Here we were, graduates of 13 years of the British Education System seemingly again headed for something that might entertain a preschooler. Still, we didn’t have long to entertain our reservations or frankly, our embarrassment. Immediately our class was divided in to two and half the class was told to play and the other half to observe them. The funny thing was that even as a student of roughly nineteen, I had pretty much forgotten how to play and it felt kind of odd to rekindle the imagination that we suppress as adults. We played but we played in a formulaic way. Our instructor looked somewhat disappointed and then curtly told us to just forget everything we knew about physics, about the properties of water and sand and the other mediums. She went on to explain that nothing was toxic and to just explore the feel and possibilities of the play, as would a child. Once we overcame our initial resistance, the result was fun. We started doing things that you see children do all the time when they come in to contact with something new. We tasted, smelled, rubbed whatever it was between our fingers. We let sand settle in to the crevices of different parts of our extremities and roll off when we moved. Play is a child’s work our instructor told us. Over a quarter century later though, I’d have to say she was wrong. Play is not a child’s work. It’s a child’s way of being. It is a fundamental need that in essence is no different to the need to eat or sleep. Yes, it is certainly their way of learning about the world and it refreshes and stimulates both body and mind, but it does so in the same way that food keeps our cells nourished and sleep refreshes us. It is no less important. Children don’t go to work (play) and then stop. Their off hours are the same as their on hours. They might be at play school but if they’re playing and nobody is telling them what to do, they’re busy being. 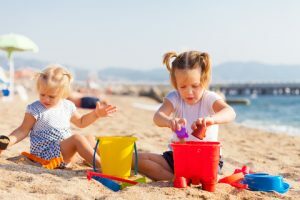 Kids benefit from both unstructured and structured play but for the purposes of this article, let’s consider the use of the term ‘downtime’ to refer to unstructured play in an unstructured environment. You see real play doesn’t even need toys. Parents think that somehow by not providing the latest and greatest electronic learning toy, gadget or purposely built fire station, that kids will miss out. Put children outside and they’ll be just as happy with a stick and some mud as they are with the most expensive toy. That’s why kids need downtime, to just ‘be’ so adults will simply leave them alone. As parents, we need to sweep away the idea that children aren’t doing anything if they are not in structured activity, being told what to. We tend to consider it better when we see children playing for the sake of learning with toys developed for that purpose. But by being or hanging around, they are playing and by playing they are learning moment by moment, not in a forced way but in a way that retains the joy of each discovery. In our society, parents are given the impression that kids should be constantly busy, constantly ‘improving themselves.’ We don’t however judge ourselves by the same standards. After all, surely what’s good for us must be good for the kids, right? That means as soon as the kids are in bed, out must come the self improvement books, so we parents can while away all those excess moments of relaxation by getting on with being a better cook, learning to sew, mastering computer code, or whatever. Never a second wasted. Ok, I’m being a tad facetious but the reason why kids need downtime is the same reason we need downtime. As parents we do work and when we stop we need downtime because our work is really work. Downtime for children just means allowing them to experience life and its inherent play value without being directed or monitored. We ‘hang’ all the time, we just don’t recognize it as such. We are not engaged in doing all the time because it’s exhausting and it’s the same for our children. Playing is their life and the more we can allow them to experience that life at their own pace, the better off they will be. There is always time for structured activities like sports, crafts and lessons but what we want is to balance that kind of activity. Not too much of one at the expense of the other, making sure whatever structured play is available is still able to be enjoyed with an active and probing mind, unfettered by the ‘right’ way of playing; the joys of which I discovered in my class a rather long time ago. You also might want to keep in mind what happens to the over scheduled child as a counterpoint that is denied that opportunity to ‘hang’ and just play. Alvin Rosenfeld, author of “The Over-Scheduled Child,” who is often most quoted on this issue, suggests some possible consequences of over-scheduling your child’s day, such as depression, anxiety, lack of creativity and problem solving skills. With all the research about our hectic lives, maybe we could all benefit from stopping for a moment to smell the roses on purpose. Instead of trying to constantly improve our children, we should notice that the reason why kids need downtime is no different to the reasons we need it. That we could and should make space just to stop and ‘hang.’ We could even join them. Try it for a moment, it’s surprising how fun it is. Suddenly you see the world from a whole new angle, your child’s angle. Stopping the rush and seeing the world through the eyes of a small child is the most eye opening experience. To stop and really see what they see, is to experience the wonder and joy they feel each and every day. The vibrance of life doesn’t fade with age, we’re just often too busy to notice it. Would you like to know the secret to building your child’s resilience? Or how to teach your child gratitude?